juancho and martina stayed with my family for 2 days while their tatay was being monitored at the hospital for dengue complications. if i had known i would be an instant mother of two last weekend, i would've eaten more carbs the week before. not that i don't have enough carbs in my system. it just would've been a good excuse. one of the things i like about sleepovers with my niece (and nephew, when he was martina's age) is having to develop original and customized bedtime stories. it has to be said that juancho and martina are two very different creatures. my stories for juancho always turned out epic, with many twists and turns, mostly because he provided me with opportunities for creative plots and rich scenarios. my stories for martina, on the other hand, just turn out to be rather ... strange. on sunday night, the stage was set for the next classic tale by yours truly. 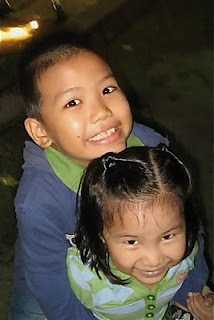 martina and juancho were clean and in their pajamas, and we were all tucked under our blankets. the story was more for martina because juancho is old enough to read (that's an understatement. i think he's gone through so many library cards already, they're running out of stock, haha). i knew he still wanted to listen though, so i planned on making it entertaining enough for the 8-year-old. earlier that day, we saw a commercial for zhu zhu pets (they're hamsters, that's the extent of my knowledge on zhu zhus) on the disney channel so i used that to kick off my story. if we used my work, my story would've started with an invasive fungal infection, and no child wants to hear about candidiasis. i think. me, storyteller extraordinaire: once upon a time, there was a hamster. and the hamster's name was? me: ok, the hamster's name was zhu zhu sparkly and she was colored? me, wanting to insert as many moral lessons as possible: zhu zhu sparkly the hamster was sad because she was the only purple hamster in the world. all her friends were brown. she cried to her mother, 'why am i purple? all my friends are laughing at me!' zhu zhu sparkly's mommy (try saying that 10x) said, 'it's ok to be different. you're different because you're special. when your friends laugh at you for being purple, just tell them it's ok to be purple.' (moral lesson #1) so zhu zhu sparkly had a friend, and her friend's name was? ... they went back to zhu zhu sparkly's house to have a snack. and they had? martina: popcorn and 'memomade' ... ALL MIXED TOGETHER. me: so zhu zhu sparkly and sparkly neever had popcorn and memomade all mixed together (the pause was longer after this sentence – i was controlling laughter, tears and a bit of pee) and they were very happy. the story ended, we all slept in different stages of fatigue, and the morning came. at breakfast, i 'tested' them to see if they remembered the story. juancho, el smarto, got all my questions right: from the flavor of the pizza to who said what to the exact snack formula. martina, on the other hand, who was the reason for the night's literary feast, replied by putting her hands over her ears and making an unsparkly face. ps: i really have no right to laugh at strange names.